A return to 'concept album' format, Clockwork Angels has the Canadian trio on great form, lacking nothing in creativity and invention. After last year's download/ singles releases, Caravan (plus BU2B), and the recent Headlong Flight, this really kicks off for me with a title track as the longest song here, and I must confess that Clockwork Angels feels overlong at seven and a half minutes. Perhaps it's still early days yet, and this is actually a minor epic - as the centrepiece of a storyline that's been fashioned to grow on the listener over time, but its impact lacks much subtlety and the lyrics are too plainly descriptive. It does, however, formally establish the steampunk motifs of this fictional universe where alchemical symbolism abounds. Harking back to Rush's The Fountain Of Lamneth, a 20-minute sidelong track of six parts on the vinyl album Caress Of Steel (1975), the richly illustrated booklet with this fan-pack CD includes a series of introductory blurbs prefacing each of the lyrics, and these words help to suggest the fabled milieu for our hero's journeys of mythic status. The Anarchist begins very well indeed, then switches into a levitational mode, spinning upwards higher and unpacking to grasp infinity with a stunning overture of the song's major themes. It's pure Rush, and instantly becomes my favourite track on this album, before it even gets to the first poetic line: "Will there be world enough and time..." and the song continues in this intriguing vein (reportedly, it was inspired by Joseph Conrad's spy novel The Secret Agent), but, instead of a politicised message, it focuses on the darkly personal: "The lenses inside of me that turn the world black/ ... A missing part of me that grows around me like a cage." The strings fire up its energy towards a powerhouse conclusion about vengeance... "They tried to get me/... They'll never forget me" which I found strongly reminiscent of Alan Moore's V For Vendetta. Carnies continues the imagery formulated in the title track; Halo Effect is essentially a love song; and Seven Cities Of Gold ("A man could lose his way, in a country like this") feels like another quest adventure in the style of Rush classic Xanadu (from A Farewell To Kings, 1977) - based on Coleridge's poem of Kubla Khan, but it excels in a rousing chorus: "Glowing in my dreams, like hallucinations/ Glitter in the sun like a revelation/ Distant as a comet or a constellation" of yearning for utopia while trapped in the endless hell of a frozen desert. This is followed by The Wreckers (unmistakably influenced by Daphne du Maurier's novel Jamaica Inn, 1936), a song which benefits from its quieter tones and a superb vocal performance: "All I know is that sometimes you have to be wary." Once again, strings lift the guitar melodies to a soaring climax. Headlong Flight has a stunning video (available online) perfectly capturing its theme of nostalgic bliss. Indeed, in recent years, Rush have been doing a lot of retrospective stuff like their Feedback EP, that engaging Beyond The Lighted Stage documentary, a definitive pair of Classic Albums studies on 2112 (1976) and Moving Pictures (1981) - exploring aspects of the band's development as unparalleled rock musicians, and the Time Machine Tour. And here they tackle progressive rock's ultimate cliché (concept albums) while refreshing it enthusiastically for the 21st century, with a newly-minted widespread appeal, so that it speaks to newcomers and older fans alike. Although, it must be said, an air of melancholic finality hangs like fog around some of these songs, especially 90-second requiem BU2B2, and closing tracks Wish Them Well, and The Garden. The music is often uplifting and joyous as ever, but a sense of being haunted by the past that borders on despair at harsh realities is keenly evoked by some of the lyrics. 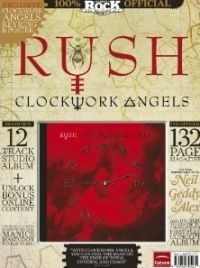 As a heavily loaded and carefully balanced album, Clockwork Angels sounds, at times, like a closing statement from this unique band's dialectic philosophy ("Hope is what remains to be seen"), and so I would not be at all surprised if this proves to be their last studio effort before Lee, Lifeson and Peart gracefully retire from the pressures of touring.